Is the Ring Pro untouchable? Is the August Doorbell Cam a serious rival? What are the similarities and differences? Their pros and cons. Read on to find out why I think that the Ring Pro is the better wi-fi video doorbell. The chart below displays the 6 main features of these doorbells and how they compare. This is for all of you in a rush- who won’t have the time to look at each section in this review! The Ring Pro is capable of recording footage at a resolution of 1080p. Both of these doorbells have night vision. The August Doorbell uses color night vision, whereas the Ring Pro uses infrared and records footage in black and white. Both the Ring Pro and the August have motion detection with adjustable sensitivity settings. The Ring Pro also allows a user to set up specific “zones” within the camera’s field of view. The Ring Pro has a huge 160° field of vision, whereas the August Cam has a field of view just 120°. Both of these smart doorbells need to be powered using low voltage, doorbell wire. Many homes have existing doorbells that are powered by 16- 24 Volt wire. But if you don’t have it installed, you need to get it installed. Surprisingly, neither the Ring Pro or the August can be controlled via Alexa- the digital assistant behind Amazon’s Echo speakers. The Ring Pro will work with Google Home and the August video doorbell will work with Apple’s HomeKit and Google Home. In this section I compare some of the basic features of these cameras. The August Cam is made by the August Company and the Ring-Pro has been made by Ring. Both of these companies are relatively young companies who have been created within the last few years to specifically make smart devices. In fact, up until last year, Ring only made wi-fi video doorbells. Now the August doorbell cam was first sold in October 2015 whereas the Ring Pro is newer and was first on sale in April 2016. In terms of weight, the August is 13.6 ounces and the Ring-Pro is 9.6 ounces . So the August is slightly heavier. Dimension wise, the August is 2.9 x 2.9 x 0.9 inches whereas, the Ring Pro is 1 x 2 x 4.5 inches. The resolution for the August is 960p whereas, the resolution for the Ring Pro is 1080p. So the Ring Pro shoots video in a lot higher definition. Now for the field of view. The Ring Pro is 160° whereas for the August it’s only 120°. So again the Ring Pro clearly has a better field of view. Both of the doorbells in my comparison have two way audio. Each of these devices has a built in speaker and microphone. This means that you can a conversation with a person who is standing next to the doorbell via an app on your smartphone. The August and the Ring-Pro both night vision. The August uses a low light technology that also produces color with it whereas, the Ring Pro uses infrared which provides black and white. You can live stream for both the August and the Ring Pro. With the August, you can only live stream using the app on your smartphone or your tablet whereas, for the Ring Pro you can watch a live stream using the app or on the browser on your computer. Both of these doorbells have motion detection and they both allow you to adjust the sensitivity of the detection settings between low, medium and high. It is important for any motion detection system to be adjustable because people live in different types of neighbourhoods and environments. For a person living in a busy street with lots of activity, they would probably want to have the sensitivity settings to low so that the doorbell only detects motion that is right in front of it. However, for a person living in a quieter area, the settings should probably be placed on “high” so that the doorbell catches every piece of the action. In addition to the sensitivity settings, the Ring Pro allows zones to be set up. These are specific areas within the field of view that can be monitored. In this section I compare look at the apps that these two smart doorbells have. So both of the devices has an app for the IOS. So that’s your iPhone your iPad! For the August you need version 9 IOS or later and for the Ring Pro you need version 8 or later of IOS. In terms of Android, for the August you need version 4.4 or later and for the Ring-Pro it is version 4. The August Cam doesn’t have an app for Windows 10 whereas, the Ring Pro does. It is very unusual for smart devices to have Windows 10 apps because so few people have Windows 10 phones compared to those who use Android phones or iPhones. Some of the best smart devices as well as providing remote access via apps, allow devices to be controlled via online accounts in traditional browsers. With the August Doorbell Cam, you cannot access or control this doorbell using any web browser. But with the Ring Pro you can control and manage it using a browser. The August doesn’t work with Wink but the Ring Pro does. The August does not work with WeMo but the Ring Pro does. Neither of these doorbells work with the Honeywell system. The August does not have an “official” channel on IFTTT but the Ring Pro does. Only the Ring Pro works with Amazon’s voice system. Only the August works with Apple’s smart home system that can be controlled using voice commands. Both of these doorbells work with Google’s voice command system. 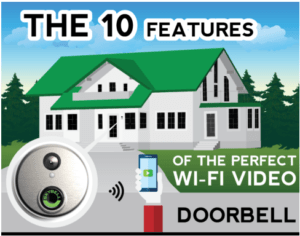 In this section I compare aspects of these wi-fi video doorbells that relate to connection and storage. The August cam connects to Wi-Fi using a 2.4 Ghz system only and the Ring Pro connects to Wi-Fi using the 2.4 Ghz or the 5.0 Ghz system. The August Cam uses Bluetooth to connect to a smartphone during the setup process. However, the Ring doorbell doesn’t use Bluetooth at all. Neither the Ring nor the August have an Ethernet port. Cloud storage is the only storage option for these doorbells. Neither of them us any other storage system, such as micro USB cards. With the August, you get the first 30 days for free. From then on it’s $4.99 per month for their cloud storage. For the Ring Pro, it is $3 per month for their cloud storage and you get the first 30 days for free. In this section I compare how each of these video doorbells are powered. Both of these doorbells can only be powered using low voltage wire. Neither of these devices can be powered via batteries. In this section I look at some of the design and warranty features of these smart devices. The August Cam is available in two color choices; silver and dark grey. Both of these doorbells are “weatherproof” although neither of them have an IP rating, which is a standardised rating showing how weather resistant a device is. 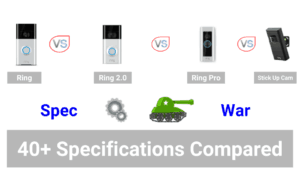 The August doorbell can operate between -25 ° C and 50 ° C.
The Ring Pro can operate between -20 ° C and 48 ° C.
Throughout this comparison, the Ring Pro has consistently shown itself to be the better wi-fi video doorbell. The Ring Pro has most of the top features that you might look for in your perfect smart doorbell. And so, in my opinion, it is a worthy gold medallist.